In 1999 the big thing on many people's minds was Y2K, or the changeover to year 2000. There was concern that computers couldn't handle the digit change to 00 or 2000 and so computerized systems like banking and traffic signals would "crash". Fortunately the world didn't fall apart when the clock moved ahead to 2000, but there were a lot of preparations in 1999 to help prepare for that. As you probably know, Ford completely redesigned the F-150 for 1997 and so changes for 1998 were minor. Ford did have some big changes for Ford truck fans in 1999 involving two trucks. The SVT Lightning returns, and the new Super Duty lineup. So for 1999, there were a lot of small changes plus two big ones. The most noticeable change to the F-150 was the new bumper & grille up front. More details on the other small changes following the big news. 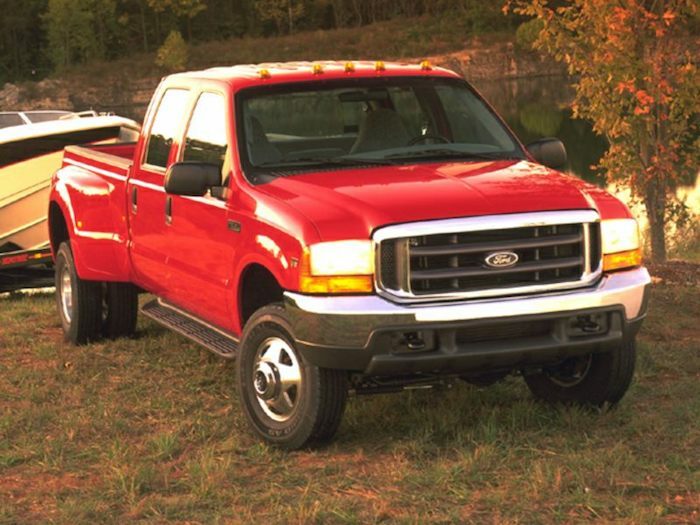 The F-250 (light duty), F-250 heavy duty, and F-350 from 1998 were replaced by the new F-250 and F-350 Super Duty models. That means the F-150 body was now only available as an F-150. Ford also announced the Ford and Harley-Davidson motorcycles partnership in 1999 and told us about the new Harley F-150 that will be out for 2000. More details on the 2000 F150 page. 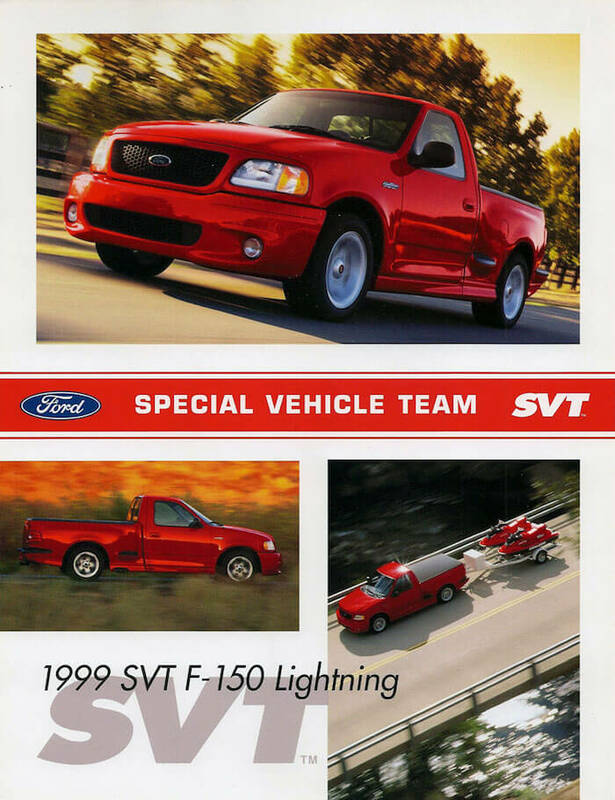 The big news for '99 is that Ford brought back the SVT Lightning truck and it better than ever. It was brought in about half-way through the model year, on March 1, 1999. The 1999 Ford F-150 SVT Lightning truck was only available in a regular cab, short box "step side" configuration. It featured a supercharged 5.4L engine that produced 360 horsepower @ 4,750 rpm and 440 lb-ft of torque @ 3,000 rpm. Engine red line was 5,250 with fuel cut-off at 5,400 rpm. The rated 0-60 mph (miles per hour) time is 6.2 seconds, 0-100 mph is 6.3 seconds, and the quarter mile was run in 14.6 seconds @ 97 miles per hour. Top speed was 140 mph (225 km/h). The color choices for the Lightning were Bright Red Clearcoat, Black Clearcoat, and Oxford White Clearcoat. There was only one interior color, so hopefully you like medium graphite cloth with leather accents. 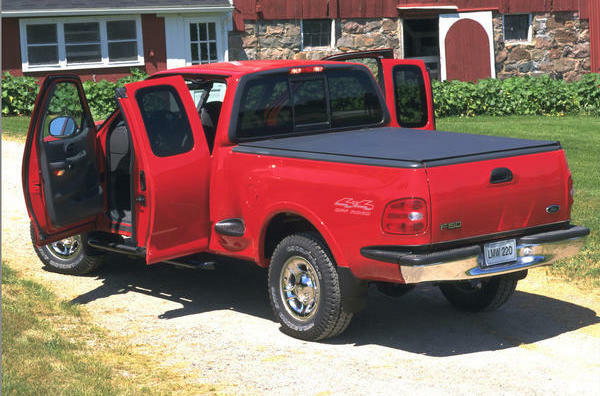 The options for the 99 Lightning included 6-CD player, soft tonneau, and Class III towing group. So on to those smaller changes I mentioned. The SuperCab model received a 4th door. 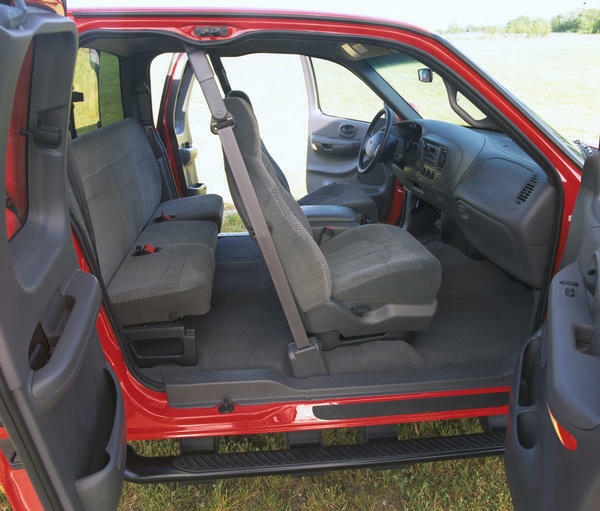 For 97 & 98, the SuperCab just had a rear access door on the passenger side, but now it had a rear swinging door on the driver side as well. The 5.4L V8 engine got a power boost of 25 horsepower to 250 hp and 345 lb-ft of torque. An upgraded 4R70W automatic transmission replaced the 4R100 trans for 5.4L-equipped F-150's in all states except California, and high altitude applications. California F-150's kept the 4R100 transmission. A new 9.84 inch dual-diaphragm brake booster was put in the F-150 (same as the F-250 has). 4-wheel anti-lock brakes are now standard on XLT and Lariat for 1999. F-150's with 4-wheel ABS also get 4-wheel disc brakes. The previous 16x7 cast aluminum wheels were redesigned. The XL trim's chrome styled steel wheels are changed to painted styled steel wheels. Inside, the front seats were revamped, and there were new interior and headliner colors. In addition to the smaller changes mentioned above, 1999 marked the first model year for the new passive anti-theft system that Ford calls SecuriLock. This is obviously a system that helps prevent vehicle thefts with an equipped truck. The most noticeable thing about the PATS system to owners is the key head is bigger and thicker than previous trucks. The other only real noticeable thing is the THEFT indicator in the instrument cluster. Apparently Ford rolled out the PATS / SecuriLock over a few years across their vehicle lineup, but information I have reports that 1999 was the big year for it's release meaning pretty much all vehicles from Ford had it starting in 1999. We have an article on how to program a PATS key here. Your vehicle is equipped with a coded-key anti-theft system. Only the correct key will be able to start your vehicle. If your keys are lost or stolen, you must take your vehicle to your dealership for key reprogramming. The SecuriLock passive anti-theft system provides an advanced level of vehicle theft protection. Your vehicle's engine can only be started with the two special SecuriLock electronically coded keys provided with Controls and features your vehicle. Each time you start your vehicle, the SecuriLock key is read by the SecuriLock passive anti-theft system. If the SecuriLock key identification code matches the code stored in the SecuriLock passive anti-theft system, the vehicle's engine is allowed to start. If the SecuriLock key identification code does not match the code stored in the system or if a SecuriLock key is not detected (vehicle theft situation), the vehicle's engine will not operate. The SecuriLock passive anti-theft system is not compatible with aftermarket remote start systems. Use of these systems may result in vehicle starting problems and a loss of security protection. Large metallic objects or devices such as the Mobil Speedpass􏰄 on the same key ring as your SecuriLock key may cause vehicle starting problems. These objects and devices cannot damage the SecuriLock key, but can cause a momentary problem if they are too close to the key when starting the engine. If a problem occurs. turn ignition off and restart the engine with all other objects on the key ring held away from the SecuriLock ignition key. Spare SecuriLock keys can be purchased from your dealership and programmed to your SecuriLock passive anti-theft system. Refer to Programming spare SecuriLock keys for more information. If one or both of your SecuriLock keys are lost or stolen and you want to ensure the lost or stolen key will not operate your vehicle, bring your vehicle and all available SecuriLock keys to your dealership for reinitialization. When the ignition is OFF, the theft indicator will flash briefly every 2 seconds to indicate the SecuriLock􏰄 system is protecting your vehicle. When the ignition is turned to ON or START, the theft indicator will light for 3 seconds and then go out. If the theft indicator stays on for an extended period of time or flashes rapidly, have the system serviced by your dealership or a qualified technician. 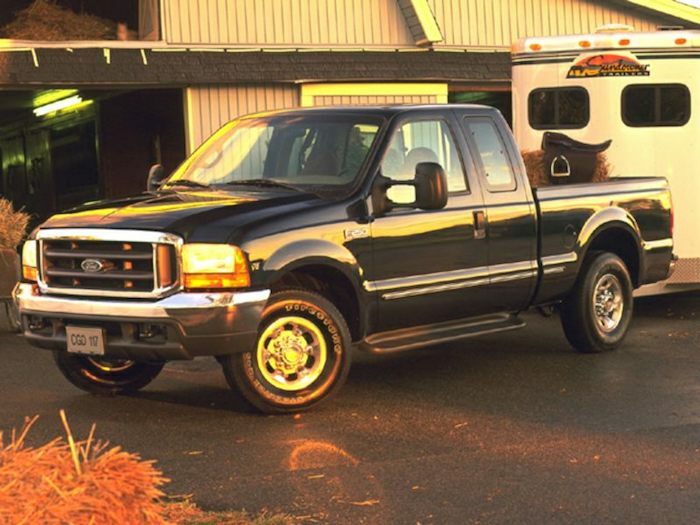 Here are a few photos of the all-new 1999 Super Duty. For more information on the truck, check out NewCarTestDrive's review.